Artists aren’t the only ones inspired by nature. Biomimicry is becoming increasingly prevalent in our society as we seek innovative solutions to ever more complex problems. The world is looking to plants, insects, birds and more for answers, with incredible results. Whether it’s on Earth or in space, it’s hard to think of a world without Velcro. The granddaddy of biomimicry, the invention of Velcro was the result of a walk in the woods. George De Mestral was walking his dog in 1948 when inspiration struck. De Mestral noticed his dog, along with his clothing, was covered with cockleburs that were quite pesky to remove. The burrs were covered in tiny hooks, which were a perfect complement to the loops found in clothing or fur. Japanese engineers solved their need for speed with the design of a new bullet train, but were facing another challenge. As trains were getting faster, reaching speeds exceeding 186 mph, they were getting so loud it was disturbing passengers, nearby residents and the wildlife. Living up to their name, the faster bullet trains generated a loud boom upon exiting a tunnel. The solution came in the shape of the kingfisher’s elegant beak. The kingfisher catches fish by diving beak-first without making a splash. By mimicking the kingfisher’s beak, the engineers made the bullet train more aerodynamic. The new bullet trains were quieter and more energy efficient. Climate change, increased population density, finite resources and the need for sustainable energy: Those needs are driving architectural innovation today and will be even more pressing in 2050 and beyond. Architects are looking to biomimicry to develop the buildings of the future. In unassuming mounds, termites live in luxury. These efficient builders use a series of holes and chimneys for a natural central air conditioning system. The outer holes are heated by the sun during the day, which pushes the cooler interior air downward through the chimneys to supply oxygen to the queen and her subjects. Carbon dioxide travels up and the cycle repeats each day. The Eastgate Centre in Zimbabwe uses these same principles to stay cool and reduce energy costs. Termite-inspired buildings, skyscrapers made of bones and seashells and renewable energy from wind turbines shaped by the fins of humpback whales could be commonplace in the cities of the future. NASA is looking to the gecko to create an adhesive that can stand up to the harsh conditions of space. Geckos easily traverse walls on feet covered with tiny hairs called setae. The hairs keep on sticking even after a lifetime of use, which is especially useful when you have a limited amount of surface area aboard a spacecraft. Gecko grippers don’t require a second surface, like Velcro, and there’s no messy residue left behind. With their powerful gripping capability, astronauts could use the adhesive to capture satellites in need of repair or pave the way for robots that live on the exterior of a spacecraft. The mantis shrimp became an internet darling due, in part, for its supersonic punching abilities and hyperspectral vision. Researchers are already developing body armor and football helmets inspired by the mantis shrimp. The creature could also revolutionize how we see cancer and visualize brain activity. Unlike humans, mantis shrimps can detect polarized light. Cancerous tissue reflects polarized light differently than healthy tissue. Doctors could use technology adapted from mantis shrimp to better detect tumors. Over time, polarized light cameras could be small enough to be incorporated in smartphones empowering people to monitor their health. Farming, food processing and object detection could also benefit from the hyperspectral vision of mantis shrimp. Falcons are among nature’s most efficient predators, so it makes sense that airplanes may take inspiration from these avian hunters. The peregrine falcon has sleek angles and an ability to contour its wings close to its body to become more aerodynamic and reduce any resistance. As a result, the peregrine falcon can reach speeds of over 200 mph as it dives for its prey. 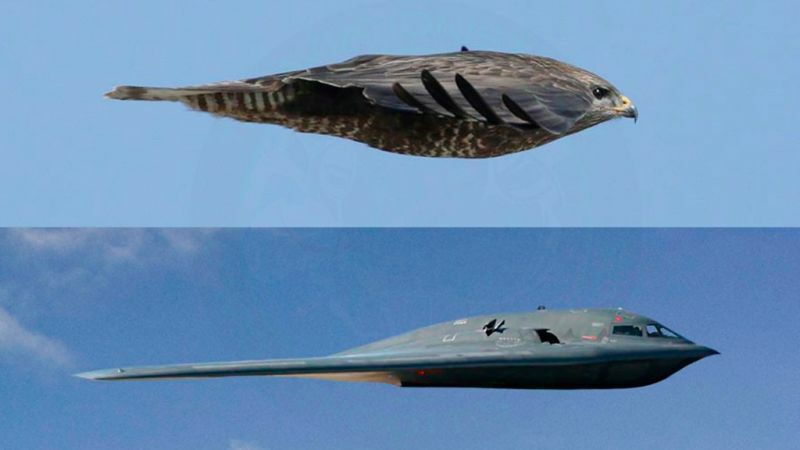 While the U.S. Air Force’s B-2 Spirit Stealth Bomber had a classified development, it wouldn’t be too surprising if prime contractor Northrop Grumman’s designers and engineers were inspired by falcons or other birds of prey. The pressure of natural selection has produced a plethora of biological solutions to the various challenges of survival. It is only natural, then, that biomimicry will play an even greater part in the future of technology.